We will have our own space and a special price at one of the most popular bars in Bogotá at the moment. 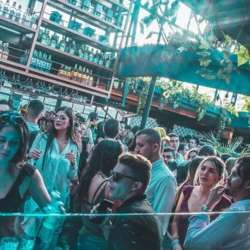 It is a rooftop bar, located in one of the most popular areas for night life in Bogotá. If you arrive between 18:00 and 20:00, you get a special price that the bar will unfortunately not be able to offer afterwards, so be on time ;)! Please come and let us all have a great InterNations Event! Special thanks to Arcesio Perdomo who helped us to organize.